The USB cable to PS/2 keyboard and mouse adapter cable converts your existing PS/2 keyboard and mouse to USB. 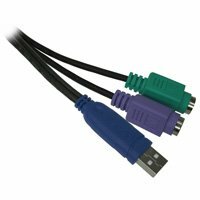 This cable is useful if your computer only has USB ports, but you still want to use your existing PS/2 keyboards and mice. Allows one PS/2 mouse and one PS/2 keyboard. Use one USB port instead of two PS/2 ports. Color coded connector. Length: 7in. Built-in converter in the cable. Chipset: GA4501.